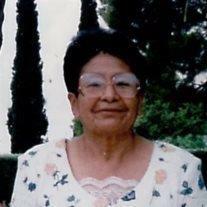 Adelaida Hernandez, 82, was called home on Monday, April 14, 2014 in Mesa, AZ. She is survived by her 3 daughters; Carmen, Blanca and Silvia and 4 sons; Carlos, Juan, Jorge, and Carlos (Milo). She was blessed with 16 grandchildren and 9 great-grandchildren (and 1 on the way). Known for her tenacity and home cooking, she will be missed by all. Funeral services are Friday, April 18, 2014 at 10 AM, preceded by a visitation at 8:30 AM at the LDS Valencia Ward, 2549 N. 32nd Street, Mesa, Arizona 85213. Arrangements by Bunker’s Garden Chapel.